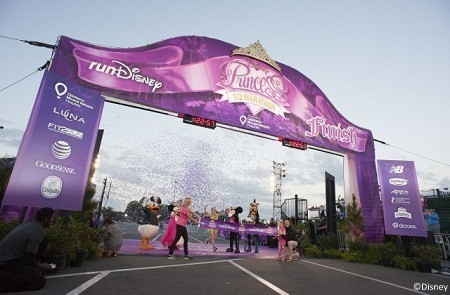 POSTED: Thu, 07/09/2015 - 16:00 | POSTED BY: Traci C.
The race weekend includes the Princess Half Marathon, the Glass Slipper Challenge, the Princess 5K, the Disney Enchanted 10K, and runDisney Kids Race. The Glass Slipper Challenge combines the 10K with the half marathon for 19.3 miles of royal fun. Other events during the Disney Princess Half Marathon Weekend include the Pasta in the Park Party, the Princess Half Marathon Weekend breakfast on Friday and Saturday mornings with the Disney Princesses, and the Ever After Party on Sunday night at Downtown Disney. The runDisney Health & Fitness Expo is also taking place on Thursday, Friday, and Saturday during the race weekend. If you're planning on registering for any of the Princess Half Marathon Weekend races it should be noted that this is a very popular race weekend and several of the races will likely sell out in hours, not days. Registration opens at noon ET on July 14 at runDisney.com. Will you be registering for any of the Princess Half Marathon events? Leave us a comment and let us know. Thanks to early registration for DVC Members and AP holders, I'm already registered for the 5K and the Glass Slipper challenge! WHooo hooo Spook! I know you're going to rock it.